I’ve got a bit of news for you. First, Optimistically Cynical will now be a weekly comic! It will come out every Monday. Hopefully that will help brighten your week. So far the response has been very positive, and I think this has the potential to be our most popular comic. When I was creating it, part of my process was to consider what I had learned over the years about webcomics and why they worked or didn’t. In some ways this is the first comic I’ve done where the web is the main goal, as the others were mostly done with print as the ultimate ambition. Also, this comic should never feel too stifling or bogged down (at least I hope not) because I plan on leaving it wide open to all ideas. I’ve already got the comic written and laid out through mid-April. It is going to be really fun, with topics ranging from Zombie Crawls to Troll 2. Eventually I’d like to do it more than once a week. But first I really need to finish Black Snow: Two Drink Minimum. I had a good chat with Mark Egan the other day, and he turned me on to some promising artistic resources that I think will help me a lot. 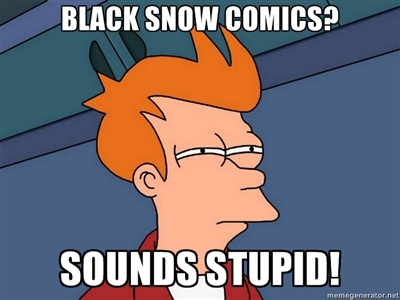 Will we get to all the Black Snow graphic novels? I hope so. We’ll see how my drawing goes. I’m also open to the idea of passing the torch to a new artist for the next book. We’ll see. Another consideration is changing up the style to make it faster and easier to draw. I’ve got a couple different approaches in mind. But you will definitely get closure on the first book in the near future. Speaking of Mark Egan, look for us to be recording a Google Meetup video chat soon. A sort of video blog thing. Who knows, if it goes well maybe it will become a regular feature. It should be fun, so stay tuned for that. Also, watch for a website redesign in the near future. A talented graphic artist has agreed to help me out, so this time it may actually look good!